Sometimes if I feel like I'm stressed too much, or if I feel that my skin hasn't been at it's best, that means I needed a Pamper Day! Do you girls have a pamper day as well? A day where you spend a time pampering your self, more like a do-it-yourself-spa-at-home? Well I do it once in a while because I know that I sometimes don't clean my skin thoroughly if I'm too tired, or I sometimes skipped one of my skincare routine, or I've been lazy using the sunscreen, etc..
My Pamper Day usually involve a thorough skincare routine and the products I used depends on the current condition of my skin. This time, my skin been looking quite dull and I also had a couple of long-staying zits here and there. Usually I don't really have acne except for that time of the month, and usually those would go away quite quickly. But nowadays the zits remains there even though it's not that time of the month, so a pamper day is definitely needed. I started my Pamper Day with thoroughly cleansing my face from all those dirt and makeup residue that might still be trapped inside my pores. I am currently using my Sibu Beauty Sea Buckthorn Balancing Facial Cleanser (which I have put away ever since because I found that it's no longer works for my skin). After cleansing my face with this gel cleanser and water, I then scrub my face with my favorite facial scrub: St Ives Blemish Control Apricot Scrub >> this is awesome! And then I followed with a light face mask. 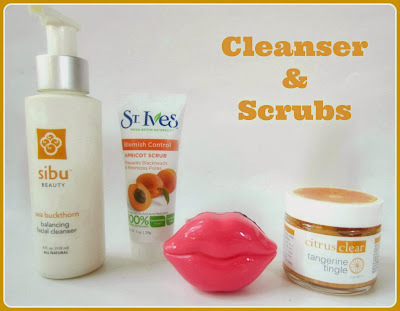 This time I chose to use my Citrus Clear Tangerine Tingle Face Mask / Scrub. It's a face mask that you can also use as a scrub. After cleansing my face and scrubbing it with the St Ives Apricot Scrub, I slather this yummy Tangerine mask made from natural ingredients. It felt a little bit tingly on my face which means that it's working its magic to my skin. After leaving it on for five minutes I then wash it off with water and pat my face dry. While putting on the face mask, I also slather a lip scrub to lift off those dead dry layers on my lips using the Tony Moly Kiss Kiss Lip Scrub. After that I got out of the bathroom and start putting on the next treatment. I wipe my face with Skin Food Tea Tree Toner + cotton pad all over my face and then put on a face mask. 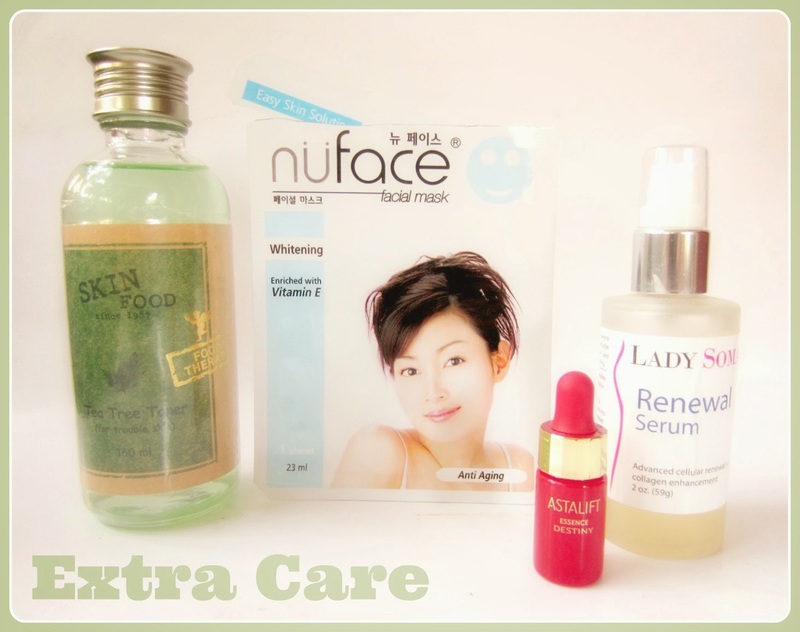 This time I chose the NuFace Anti Aging Whitening Facial Mask because I feel like my skin needs extra treatment. After leaving the face mask for 10 minutes, I took the mask sheet off, throw it away, and put on some serum to my face prior to using moisturizer. I mixed my Lady Soma Renewal Serum with a couple drops of Astalift Essence Destiny which is great for both anti-oxidant and anti-aging treatment. After the serums are fully absorbed by my skin I continue with moisturizer and eye treatment. My current moisturizer is the Etude House Moistfull Soothing Gel which is good for normal to dry skin. This gel absorbs quickly to my skin and keep it stays moist. After moisturizer I also put on a pre-serum for eyes which is the Estee Lauder Advanced Night Repair Eye, straightly followed by my current eye treatment which is the C+M Voom Green Tea Eye Gel that is supposed to help reduce those dark circles and puffy eye bags underneath the eyes. Next is lip treatment. I usually just put on a lip essence first and followed by a lip balm to keep my freshly scrubbed lips stays healthy. 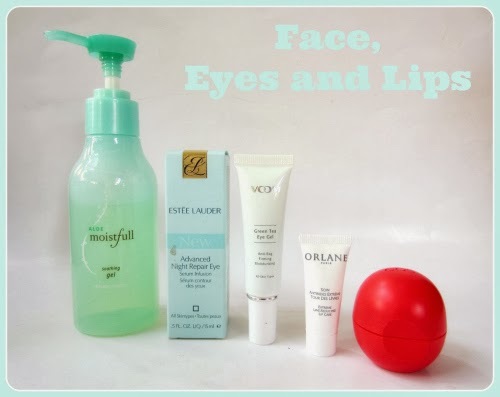 I used Orlane Extreme Line Reducing Lip Care as the extra lip treatment, and EOS Summer Fruit Lip Balm to help my lip stays moist. I actually also did an all-over body pamper while doing all of the skin treatments above, but I'm gonna post about my body pamper in another day. I usually dedicate one day just for doing a personal pamper day, making a time to thoroughly treat my body and face with a mini extra treatments that they deserve. A nice pamper day also allows me to relax a bit. How about you? Do you do a mini pamper day at home too? wih iini bener2 deh bukan double ato triple tapi fourtle layers kali ya.. mantap. emang butuh skali2 kaya gitu apalagi kl smpt males2 pake skincare. I love pampering my self once in a while too!